Michaan’s offers precious Chinese snuff bottles, a delightful bronze elephant, and Japanese woodblock prints by Hiroshige. ALAMEDA, CA, USA, February 22, 2019 /EINPresswire.com/ -- PRE SALE PRESS RELEASE! The San Francisco Bay area, gateway to the Pacific, has long played an important role in the trade of Asian art treasures. At Michaans’s Auctions, high quality Asian art and antiques have been a core business since the company’s inception. In the March Gallery Auction, Michaan’s offers precious Chinese snuff bottles, a delightful bronze elephant, and Japanese woodblock prints by Hiroshige. Also among the March highlights is the large collection of engravings by Karl Bodmer, whose body of work forms an important historical record of the American West. Bodmer’s exquisite 19th century scenes of Native Americans will thrill collectors of fine art as well as American history buffs. Estate jewelry, period furniture and many more fabulous finds are also offered at Michaan’s on March 9. 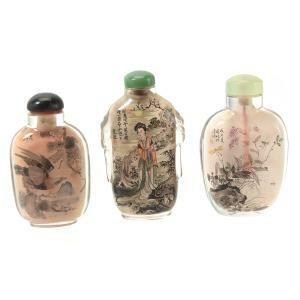 A good snuff bottle collection is a survey of Chinese art, in miniature. The insidepainted snuff bottles ($400-$600 for the lot of three in the March auction) feature the delicate brushstrokes of traditional Chinese painting in an art form that never fails to fascinate. 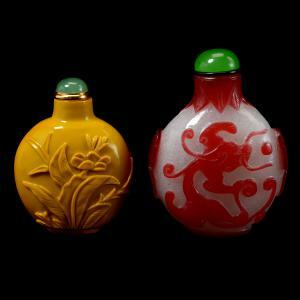 The pair of overlay glass snuff bottles ($600-$800) features the carved glass technique perfected by Chinese artisans after centuries of carving jade. And the glazed snuff bottle ($300-$400) is robin’s egg blue, a favored hue among collectors of Chinese porcelain. Is there any animal more universally beloved than the elephant? Revered by many cultures and cherished by even more, the elephant is an important motif in the decorative arts and interior design. 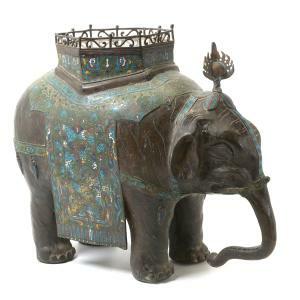 March brings to Michaan’s a handcrafted bronze Asian elephant estimated at $1,000-$1,500, with polychrome decoration and a lovely patina. The works of master printmaker Hiroshige (1797-1858) are fundamental to any collection of Japanese woodblock prints. Hiroshige’s reputation was already well established in his day, and later in the 19th century his works were discovered and even copied by the European Impressionists including Van Gogh. A collection of eleven Hiroshige woodblock prints ($1,800-$2,000) is featured in the March auction. Scroll paintings, embroidered textiles, carved jade and fine Chinese porcelains are also offered. The art of Karl Bodmer (1809-1893) is presented in March by Fine Art specialist Susan Paffrath, who offers ten lots of Bodmer’s hand-colored engravings. “The value of Bodmer’s work is recognized by historians as well as art collectors,” notes Paffrath. “His wonderful images document the great diversity in Native American cultures, while also highlighting the individuality of his particular subjects.” Bodmer’s engraving of a dancing warrior (“Pehriska-Ruhpa”) is estimated at $5,000-$7,000, one of many Indian portraits on offer. Also offered are the wildlife scene, “Herd of Bison and Elks” ($2,000-$3,000) and a view of 19th century Niagara Falls ($1,000-$2,000). “Milestone Mountain” ($3,000-$5,000), an Ansel Adams print with excellent provenance, is another fine art highlight. Works by Peter Max and Roy Lichtenstein are offered. “Summer,” a bronze by cowboy artist William Moyers (1916-2010) is estimated at $2,000-$4,000. The large oil painting “Jungle” by Fernand Pierre is one of two works by Haitian artists. Pierre’s lush pictorial style recalls that of the 19th century French painter Henri Rousseau, while springing wholly from the natural environment and artistic heritage of his native Haiti. Brilliant color and lushness can also be found in Michaan’s March fine jewelry. A stunning floral enameled jewelry suite features diamonds, ruby cabochons and cultured pearls set in 22k gold. The large Mughal-style suite by a contemporary Indian designer is estimated at $30,000-$50,000. Also offered is a beautiful jadeite jade bangle bracelet ($4,000-$6,000). “The bangle comes with a GIA report confirming ‘A’ jade, no color treatments, and has wonderful translucency” says Michaan’s gemologist Elise Coronado. A standout in March is the custom diamond ring designed as a comet, with a trail of diamonds following from the brilliant-cut center stone of over one carat ($2,000-$3,000). 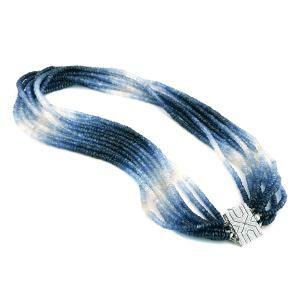 The sapphire ombré bead necklace ($1,800-$2,500) is another highlight. A gleaming 18k gold bracelet, heavy with gold coins and charms, is estimated at $4,000-$6,000. 25 of the March jewelry lots come from the estate of Wylda Hammond Nelson, MD, who collected beads and tribal jewelry from around the world. These lots include the ancient Persian necklace ($500-$700) of etched carnelian and carnelian beads. Estate furniture highlights include the McGuire bamboo form dining table and eight chairs, a great find at $1,000-$1,500. Luxury items in this auction include a Fendi fur and a Daum pitcher.